Many artists remain relatively unknown during their lifetime, or afterwards. Of course there are some artists who are now internationally famous but did not sell much work whilst alive, recognised only after their death eg Van Gogh, Vermeer. 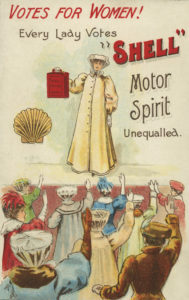 But the trend of low recognition is even more common for female artists as their work was rarely exhibited in the past. In Janson’s ‘Basic History of Western Art’ just eight percent of the three hundred artists listed are female. And unfortunately even today the public can list many artists names, but struggle to name five female artists. The trend of proportionally not exhibiting female artists continues with only thirty percent of the world famous Turner Prize nominees being women. When we started researching the female artists in our collection through our traditional sources we struggled to find anything on the three female artists we have listed at the top of this blog. So we are throwing our search wider – do you know anything about them? This is what we know of these artists, and it isn’t much! 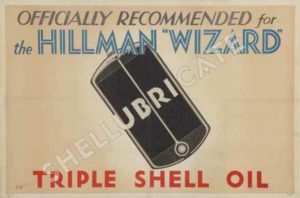 Elizabeth Holman produced two posters for Shell; Poster 279, Snowflake for lamps and stoves in 1930 and poster 300, Hillman Wizard in 1931. 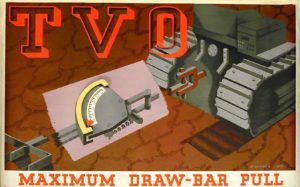 Bridget Workman produced Poster number 494, TVO for Maximum Drawbar Pull, for the Shell Mex BP brand in 1937. Angela Barlow – produced poster number 1525A, Wrens in 1952 and a Valentine card design also in 1952. 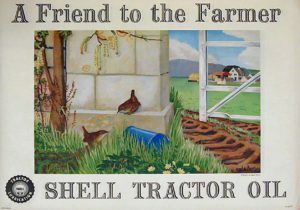 These artists may have worked in the Shell Studio as commercial artists or they may have been independent artists paid on commission. Please do get in contact if you have a link to these three women, we would love to hear from you.